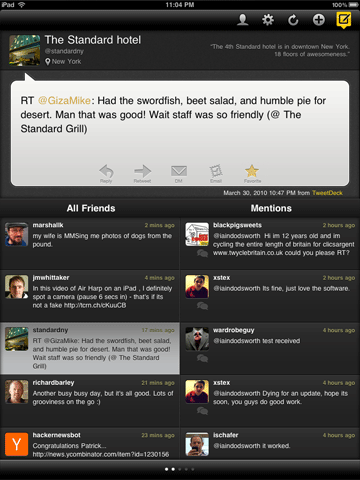 Tweetdeck has just announced that it is bringing its well-respected Twitter app to the iPad. The app is available for free now, for use with the iPad from launch tomorrow. Far more than just being a port of the iPhone or Adobe Air versions of the app, Tweetdeck for iPhone is completely re-worked for the iPad. Designed to work in either landscape or portrait modes, the big news here is a map mode for viewing geotagged tweets. A full feature list and video is below. We think Tweetdeck has gone down the correct route of reinterpreting the app for a completely new type of ‘casual computing’ device. While you can tweet perfectly well from an iPad, it looks like Tweetdeck will be the perfect app for just sitting back and browsing the Twitterverse with that gorgeous 9.7″ screen and map view. Other Twitter apps available at launch include a new version of old favourite Twitteriffic and Twitepad, which allows users to browse the web while they tweet. Here’s the feature list provided by Tweetdeck. You can find out more on the Tweetdeck website. reply, retweet, direct message and favorite from a tweet. see recent updates and who a person is following and being followed by. follow or unfollow and block or unblock a user. add All Friends, Mentions and DM columns. add Twitter list columns – both lists you’ve created and those you follow. cross post updates to any combination of your accounts. access your Twitter contact list. upload photos (from the on-board Photo Library). rearrange columns however you like and delete those you no longer need. view geocoded tweets on a full-screen map.